When we auscultate the heart, we normally hear the first (S1) and second (S2) heart sounds. Here are ten key facts about the first heart sound to be aware of when you're examining patients. The first heart sound (S1) results from mitral and tricuspid valve closure. Although S1 has two separate components (the mitral component and the tricuspid component), they occur so close together that they're normally heard as a single sound. If the patient's circulation is hyperdynamic, S1 will be louder than usual. 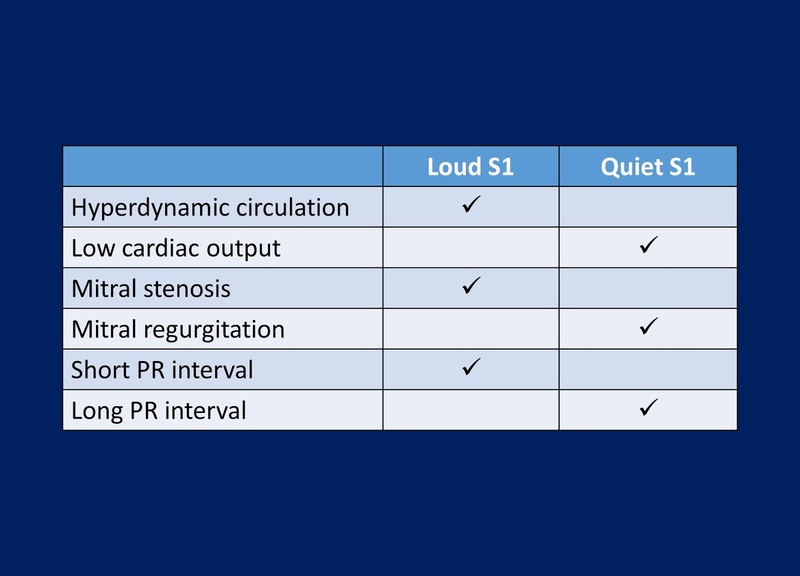 Conversely, S1 will be quiet if the patient has a low cardiac output. S1 is louder than normal in Wolff-Parkinson-White syndrome. Why? Because the short PR interval in WPW syndrome means that the mitral leaflets are still widely separated at the start of systole. Conversely, S1 will be quiet in the PR interval is long. This is because the mitral valve leaflets have already started to close by the time that systole begins. S1 is louder than normal in mitral stenosis, for the same reason as with a short PR interval - in mitral stenosis, the slow exit of blood from the left atrium through the narrowed mitral valve means that the ventricle is still filling with blood, and thus the mitral leaflets are still widely separated, at the start of systole. In mitral stenosis, S1 can be so loud that it can be palpated at the apex. This is described as a 'tapping' apex beat, the palpable first heart sound in mitral stenosis. 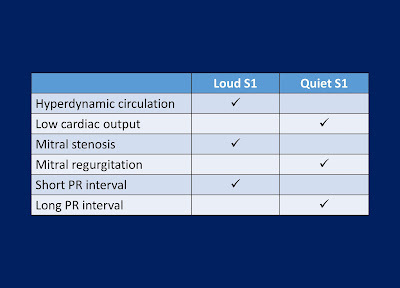 S1 is quieter than normal in mitral regurgitation. An S1 of variable intensity is heard with atrial fibrillation, ectopic beats and complete heart block. If you enjoy this cardiology blog, why not sign up to the e-mail list and get every new blog sent direct to your inbox? Signing up is quick and easy - just enter your e-mail address in the box below and click 'subscribe'. Isn't S1 soft in WPW?